A sugar detox can help you lose weight pretty quickly because many foods that have a lot of sugar ALSO have a ton of calories. Therefore, when you eliminate things such as sodas, cakes, ice cream, and most processed foods from your diet, you should see some weight loss. However, you must remain in a caloric deficit to lose weight, and this becomes much easier when you don’t eat high-calorie sugary treats. Aside from weight gain, sugar can cause many other health problems. According to a study published in JAMA (Journal of the American Medical Association), excess sugar can even lead to an early death. The study showed how sugar can cause cardiovascular disease, diabetes, and obesity. The study also demonstrated how a sugar detox and adopting a low-sugar diet as a lifestyle choice can lead to better overall health. Another study by the World Health Organization (WHO) showed that increased consumption of sugary beverages is associated with obesity in children. This shows the danger of consuming sugar when it’s extracted and put into foods unnaturally. 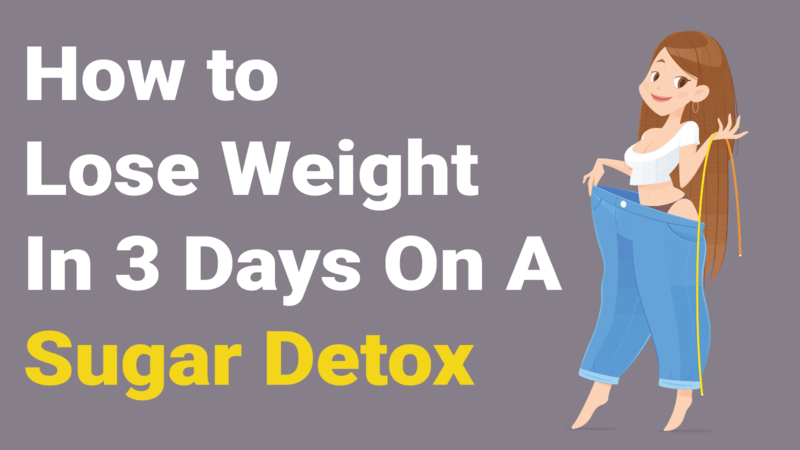 In this article, we will help you learn how to detox from sugar once and for all and drop weight in a short amount of time. You don’t have to spend hours in the gym to lose weight; you need to primarily focus on your diet when it comes to weight loss. First of all, let’s talk about what your diet should primarily consist of. To lose weight, you need to decrease your calories while still eating foods that satiate you. How do you do this? Eat foods with the most nutrients possible so that you get full easier. Most fast foods and processed foods do exactly the opposite of what we want for weight loss; they have a lot of calories, but very few nutrients. So, you’ll want to eat things like leafy greens and other low-sugar vegetables. You should also consume nuts, seeds, low-sugar fruits such as berries, lean and/or fatty meats depending on your preference, and whole grains in small portions. You can also eat dairy products if you wish, but try to purchase varieties without fillers that might have hidden sugars. Anytime you crave sugar, opt for some fresh fruit instead. It will satisfy your sweet tooth without the nasty side effects that you may experience with processed and refined sugar. On your journey to detox from sugar, you’ll also need to check labels quite religiously. Processed foods usually contain added sugar to make it more satisfying for the customer. Remember, food companies don’t really care about consumers’ health (most of the time). They care mostly about lining their pockets. So, the responsibility falls on us as consumers to check labels for ingredients that will only do us harm, like added sugars. 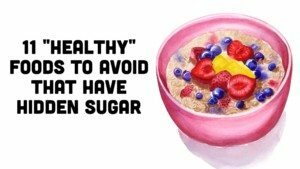 Salad dressings, sauces, and even some “health” foods like granola bars can contain a ridiculous amount of sugar. ALWAYS check the label before you buy something. Now that we’ve given you some tips on what you can eat and what you should look out for when grocery shopping, let’s talk about specific meals you can eat that will promote weight loss. Breakfast: 1/2 cup of oatmeal with nuts/seeds/berries and three eggs (scrambled or boiled). Morning snack: 1 serving of nuts. Lunch: Chicken thigh with a serving of leafy greens and sweet potatoes. Dinner: Salmon with two or three more servings of green vegetables. Breakfast: Same breakfast as above, and you can add a couple slices of bacon if you wish. Morning snack: A small bowl of nuts and a serving of berries. Lunch: A big green salad tossed in olive oil and lemon juice as a dressing. Add whatever low-starch veggies that you wish. Dinner: Roasted veggies such as Brussels sprouts, broccoli, and sweet potatoes with a bowl of chicken noodle soup. Breakfast: Spinach omelet with full-fat cheese and two slices of bacon. Morning snack: A serving of berries. Lunch: Salmon with a serving of greens. Dinner: Zucchini pasta with red sauce, mushrooms, broccoli, ground beef, and cheese. As far as liquids, make sure you keep them in mind during your sugar detox. Eliminate all drinks with added sugar like soda and energy drinks. Instead, consume plain water or water with cut up lemon, herbal tea, or unsweetened coffee.